More than three years after a EF-5 tornado devastated Joplin and destroyed 10 of its schools, the school district marked a new beginning with a high school dedication ceremony featuring Vice President Joe Biden and Secretary of Education Arne Duncan. Biden drew applause when he said, “Folks, you’ve given an entirely new meaning to the word ‘homecoming,’” according to the design firm DLR Group. CGA Architects was a design partner on the 475,000 square-foot, 3,000-student capacity project. Students have attended Joplin Interim High School – a 88,000 square-foot building that was once a retail store – since the high school was destroyed in May 2011. Then, too, DLR Group and CGA Architects teamed up to design the temporary high school, only then they had to do it in 55 days during the summer. This interim facility ended up playing a role in the design process for the architects. “DLR Group’s experience in Joplin has been an emotional journey. From the very beginning we knew the needs of students and the community were special and we didn’t want to let them down,” Kevin Greischar, DLR Group principal, said in a statement. “Most districts don’t get the chance to test design concepts in a temporary facility before building a new high school. We took full advantage of this opportunity to allow the interim school to inform the design for the permanent school,” Greischar added. The high school was designed around the vision of a “career to college” education, with an emphasis on technology and preparing students with relevant, real-world experiences. 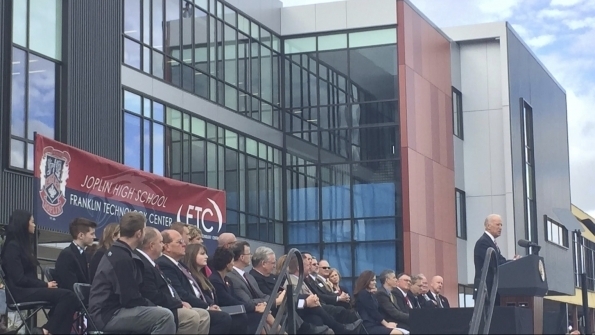 “The school is designed to support 21st Century learning through flexible areas for collaboration and inquiry-based problem solving that will propel students toward success in a variety of careers,” Greischar said. The high school will offer the following career pathways: arts and communication; business and information technology; health services; human services; and technical sciences. Students are grouped with others who share similar interests. “Freshmen begin their career pathway experience on the third floor of the building and continue to progress down to the first level throughout their four-year experience. Transparency through abundant glass walls and windows allows all students to peer into laboratories and learning spaces to create a sense of excitement about activities occurring within. Bridges connect the upper two levels of the school. Outdoor courtyards on the first level are designed to support specialized learning activities and allow students to travel from one area of the building to the other in a secure, outdoor environment. “The center of the school is known as Eagle Alley. This themed space is where the career to college concept comes to life. All career pathways spill into Eagle Alley, which is also a social gathering spot for students. A student-run coffee shop, spirit store, 66-seat restaurant, and additional flexible spaces offer business opportunities for entrepreneurs.